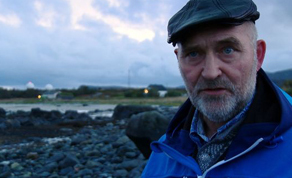 With ‘Atlantic’ hitting cinemas on Friday, April 29th, we talk to filmmaker Risteard Ó Domhnaill. After previously taking a behind the scenes look at Ireland’s Corrib Gas controversy with his IFTA-winning ‘The Pipe’, O’Domhnaill realised that a wider story of resource mismanagement was emerging — one that needed to be told for the sake of coastal communities everywhere. ‘Atlantic’, which started as an ambitious crowdfunding project and is now backed by the Irish Film Board, the Canadian Broadcasting Corporation, the Newfoundland and Labrador Film Development Corporation and Nordnorsk Filmsenter (the North Norwegian Film Centre), is that story. Emmy Award-winning actor Brendan Gleeson narrates the film shot across Ireland, Norway and Newfoundland (Canada) by Scannáin Inbhear (Inver Films). Risteard Ó Domhnaill: ‘I couldn’t get support anywhere in Ireland. I hit a brick wall. There was no real appetite for this kind of a story. So, I put it out there on Fundit and people stood up to the plate and put their hand in their pocket. We raised an incredible €56,000. It allowed me to travel to Newfoundland and Norway but it also allowed me to argue my case with the Irish Film Board who matched what we raised with crowdfunding. The overall budget was €235,000 with national broadcasters in Canada and Norway. It’s obviously a completely different story but it’s in the same arena; was the foundations for ‘Atlantic’ laid with your debut feature documentary ‘The Pipe’? In all three locations though you managed to find very powerful contributors, as was the case with ‘The Pipe’. Is it a case of focusing in on these people when you find them or is it just luck? And another voice we are following in ‘Atlantic’ is that of the narrator Brendan Gleeson; blessed with the Morgan Freeman quality of having a very distinctive voice. How did Brendan come on board? With something like ‘Atlantic’ with such a consistently enthralling story – how do you know when to stop filming and just get this story out there? How do you hope people will react when they watch this documentary? Between ‘The Pipe’ and ‘Atlantic’, it seems this story of the small man’s struggle against big sea-faring corporations has captivated you. Is there another documentary in the pipeline that will follow this similar vein? ‘Atlantic’ is in cinemas April 29th.